Was anyone else as shocked as me to realize that as of this weekend, there are only two weeks left until Christmas? I've had my tree up and the Christmas tunes playing for about a month now, but it hasn't really sunk in yet that the big day is fast approaching. As a result, I have been completely neglecting my Christmas shopping and have only started shopping for two people so far (and haven't finished either one). I feel like I need a really big snowfall to happen to make me believe it's Christmas and kick me into gear. But since that isn't likely to happen anytime soon, my second option is to start baking a boatload of cookies; nothing says the holidays like pounds of butter and sugar, and even better, eggnog! 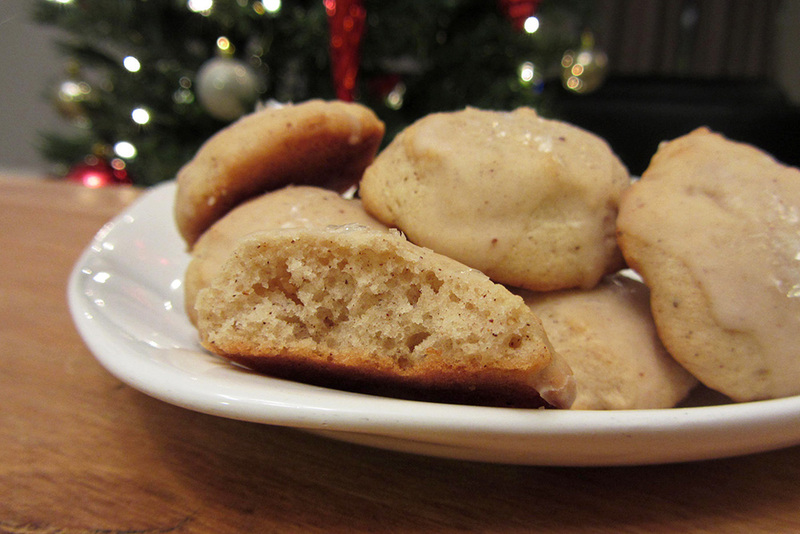 These eggnog cake cookies are just the thing to give you that warm, fuzzy, Christmassy feeling. 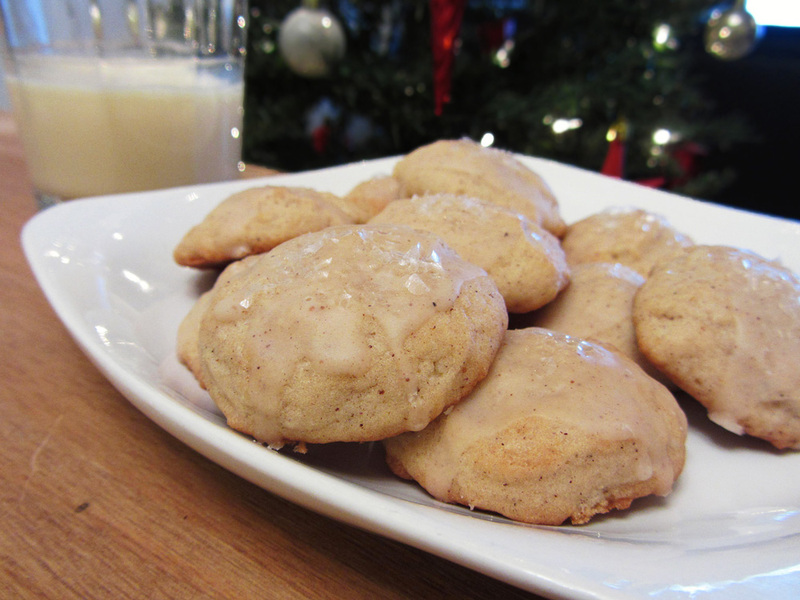 I've had a lot of trouble in the past baking eggnog flavoured things that actually taste like eggnog, so I didn't have high hopes for these cookies. 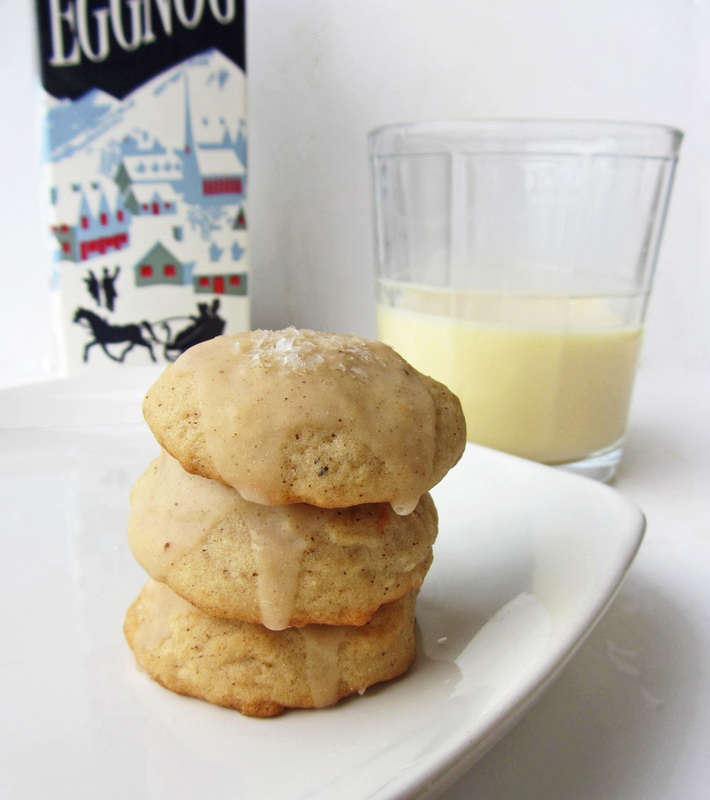 But much to my surprise and delight, both the cookie itself and the eggnog icing had a very distinguishable eggnog flavour with just the right hint of spice, and the two combined to create a deliciously soft and cakey cookie. I sprinkled a little edible glitter on top of the icing to give them a festive sparkle, but you could easily leave them plain or add your own decorations! The original recipe didn't say how many cookies it made, so I cut the recipe in half and was glad I did because I still ended up with a lot of cookies. They are small though, which is good for sharing with lots of people, but bad for people with no impulse control like me, because it was so hard to stop eating them! I brought these to my coworkers and to a cookie swap and everyone said they loved them - one girl even commented that she doesn't like eggnog but loved these cookies, so you don't have to be an eggnog lover to try them (though people who don't like eggnog baffle me)! Beat the butter and sugar with an elector mixer on medium speed until light and fluffy, about 2-3 minutes. Add the egg and vanilla and beat well. Add the eggnog and beat until incorporated. In a separate medium bowl, whisk together the flour, baking powder, baking soda, salt, nutmeg, and cinnamon. Slowly add the dry ingredients to the mixer bowl with the mixer on low speed, and beat until everything is just combined. Cover the dough and chill in the refrigerator for 1 ½ to 2 hours. Preheat oven to 350°F. Drop dough by rounded teaspoonfuls onto parchment paper-lined cookie sheets. Bake one sheet at a time for 9-11 minutes, or until tops are lightly golden. Transfer to a wire rack to cool. Whisk all icing ingredients together in a bowl until smooth. Leave cookies on a wire rack but place a tray or parchment paper underneath to catch drippings. Spoon icing onto cookies and let drizzle down the sides. If adding sprinkles, glitter, or other decorations, do so while icing is still wet.